Many companies have come to realise that, with the rising cost of floor space and expense of moving, an ideal solution is making use of wasted headroom in their warehouse, factory or industrial unit. 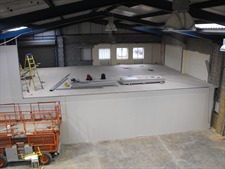 Gifford Grant provides a complete design and build service for mezzanine floors including initial survey, structural drawings and calculations, core samples, and a total installation complying with current Building Regulations and Fire Officer requirements. Mezzanine floors are a quick and inexpensive way to increase the space in your office or add more storage. 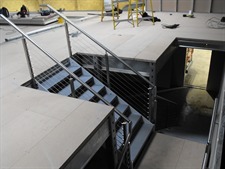 At a fraction of the cost of moving premises a mezzanine floor can provide additional space for storage, offices, meeting rooms, canteens or toilets. Whether you are planning to relocate and fit out a new office or refurbish your current offices, contact us on enquiries@gifford-grant.com or telephone 01252 816188 to arrange a consultation. "...I know the team put in a lot of effort into making 2 Catherine Place a flagship that the Federation of Small Businesses can be rightly proud of. The end result has received praise from all who have visited the office."